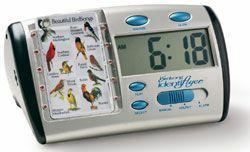 Birdsong Identifier Alarm Clock | OhGizmo! This is for the bird lovers. If you’re related to Grizzly Adams or just an outdoor person, you probably can’t wake up to the normal generic alarm clocks. What you need is a Purple Finch that gives you extra energy to wake up every morning, like only a bird’s delicious chirp ever could. Me, I’m just wondering when they can come out with one that has piglet sounds. The Birdsong Identifier alarm clock uses Identifier Song Cards to play the tones it uses to awaken you from slumber. All you do is choose a song card of your choosing, like “America’s Most Beautiful Birds?? ?, and you will rise to the sound of the Purple Finch, Northern Cardinal, or one of seven other birds. The clock requires batteries, which almost solidifies its ineptitude at being anything more than a novelty. Story VIA The Gadget Blog. DO YOU HAVE AN ALARM CLOCK THAT PLAYS THE BUGLE THAT STARTS HORSERACES?